The dating-focused social-media company is benefiting from strong engagement and the rollout of new video features. The Meet Group, Inc. (NASDAQ:MEET) stock climbed 53.4% in May, according to data provided by S&P Global Market Intelligence. The social-media company's shares popped following better-than-expected first-quarter earnings results and the launch of live video streaming on its LOVOO platform. Sales for The Meet Group's quarter ended in March came in at $37.6 million, topping the average analyst estimate's call for sales of $34.2 million. Total revenue for the quarter was up roughly 88% year over year, and mobile revenue was up 63% in the quarter. 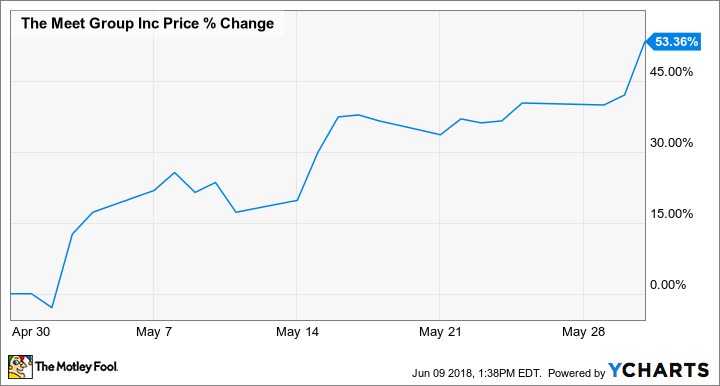 Earnings for the period also came in better than anticipated, with the average analyst targeting non-GAAP earnings of $0.02 per share and actual results coming in at $0.05 per share. The Meet Group operates four main social-media platforms -- MeetMe, LOVOO, Tagged, and Skout -- and it's seen encouraging engagement growth. The company managed to more than double its daily active users (DAUs) year over year, with DAUs rising from 2.03 million in the first quarter of 2017 to 4.85 million at the end of this year's first quarter. Shares then posted substantial gains on May 15 following the announcement of LOVOO Live, a video service for its LOVOO dating platform, launching in Austria. Just one day after launch, 15% of LOVOO members in the country had used the streaming feature -- evidencing rapid adoption. The Meet Group's impressive stock gains have continued in June. They climbed at the start of the month thanks to news that the company was rolling out LOVOO Live in France and Switzerland, and encouraging early results from the feature's launch in Austria. Shares popped again on June 12, corresponding with the launch of LOVOO Live in Spain and Italy. The stock has gained roughly 18% in June as of this writing. With a market capitalization of roughly $300 million, The Meet Group is a relatively small competitor in social media compared to the likes of Facebook and Twitter, but the company could be an appealing play in the space even after its big gains. The company is valued at roughly 2 times this year's expected sales and 18 times this year's expected earnings -- attractive metrics in the context of Meet's rapid growth.